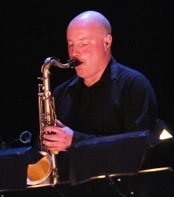 Fred Glesnes, hailing from Tromsø Norway, is a professional sax player, composer and arranger. His education includes Master of Music, Jazz Performance from Western Michigan University, and Tromsø University College Faculty of Art – Music Conservatory. Glesnes has earned domestic and international recognition, and has toured extensively in Scandinavia, Europe and the US. In addition to composing, arranging and conducting for big bands and orchestras, he’s worked with international greats such as Bob Mintzer, Randy Brecker and Nils Landgren. Nationally he’s worked with acclaimed artists such as Frode Alnæs, Anne Grethe Preus, Sondre Lerche, Ralph Myerz and the Jack Herren Band, Steinar Albrigtsen, and Odd René Andersen. He does a lot of performances for national broadcast channels NRK and TV2. Glesnes recently released an album with the Glesnes/Ytreberg Quartet, where he collaborated with bassist Ytreberg on all the compositions and arrangements. Other recent projects include the Mandela Celebration 08’, where he was the musical director. Artists from all corners of the globe participated. The microphones of choice are the WI5 for alt – and tenor saxes, and the TA2 for the soprano sax. He also uses the WI5C to make the TA2 wireless. Check out the reviews of WI5 and TA2 in the September edition of Tunes, in stores now.